Fast Video Converter PRO by DVDFast, is an all-in-one video converter for converting videos of all the popular formats including AVI, ASF, AVC, DIVX, FLV, H264, MP4, MOV, MPEG1/2, OGG, RM, RMVB, VOB, WMV, XVID, 3GP, 3G2 and etc. Fast Video Converter Pro also able to create fascinating photos from video files. With this easy, fast and reliable video converter, the users may easily get the specific video format watched on TV, played on portable media players, loaded to mobile phones or put on websites. 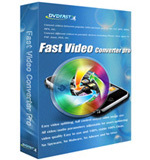 Converts Videos between Popular Video Formats – Fast Video Converter PRO enables you to convert videos between popular video formats, such as HD AVI, HD H.264 / AVC, AVCHD (.MTS, .M2TS), HD Quick Time, HD MPEG-2 TS, HD MP4, HD WMV, SD AVI, ASF, AVC, DIVX, FLV, H264, MP4, MOV, MPEG1/2, RM, RMVB, VOB, WMV, XVID, 3GP, 3G2 and etc. Converts Multiform Videos to Portable Multimedia Devices – Converts multiform videos to portable multimedia devices including AVI, WMV, FLV, MP4, MPEG, iPod, iPhone, Apple TV, PSP, PDA, 3GP, Zune, Music, XviD, DivX, JPG, BMP and etc. Supports Batch Conversion – Batch converting video process. The support for multithreading and batch process makes your video conversion faster and handier, while the top quality of Fast Video Converter PRO makes your watching and listening more colorful. Fastest speed to convert video – The built-in multi-thread encoding technology makes the conversion speed faster than ever. It not only can help you convert files at high speed but will also improve the speed of which the video conversion takes place. Extracts Audio From Video – You will get a standard WAV/WMA/MP3 audio file that you can play whenever you want by taking advantage of the extract audio from video option, without having to run the video. FREE, Award-winning Customer Support for All Users – 100% free technical support and community support within 24 hours. To grab the free Fast Video Converter PRO v1.0 license serial code with download link, which normally cost $24.95 to purchase, just head to the following URL from now till 30 November. The free license code of Fast Video Converter PRO can be used for up to 10 computers, and thus can be given to up to 10 family members or friends as a Thanksgiving Day gift.